Have you ever looked at your knee and thought, “My knee is swollen,” especially after you fell or twisted it awkwardly? Does that swelling indicate structural damage in your knee. In this Ask Dr. Geier video, I explain what to watch out for. One of the most popular articles I’ve ever written on my site is one titled, “Signs your knee injury could be serious.” In it, I share 5 or 6 signs and symptoms that could suggest that you might have broken or torn something in your knee. A swollen knee is one of those signs. 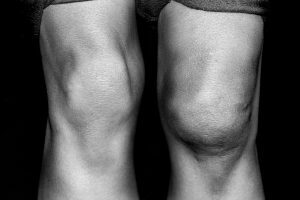 To be fair, it’s not uncommon for your knee to be a little swollen after doing really aggressive sports or exercises activities for a couple of hours. If your knee is swollen so much that it looks like a volleyball or basketball, then that’s a different story. There aren’t many normal reasons for your knee being that swollen, especially after a traumatic event. In this video, I discuss the possible injuries that could cause your knee to swell that much. Episode 362: Is it a good idea to see a chiropractor for bone or joint pain or injury? I can’t bend my knee. Should I be worried?